I could not resist making an early visit to the Royal Academy’s latest exhibition, entitled ‘America After the Fall: Painting in the 1930s’. For one thing I knew it included one my favourite American paintings, Grant Wood’s famous and much parodied ‘American Gothic’ (1930, above), which I’ve loved since I first discovered it as a teenager. (I came to the picture, as it happens, by way of David Ackles’ superb album of the same name, which itself paid affectionate tribute to Wood’s painting with the back cover image of the singer and his wife in front of a frame house). For another, it’s hard, these days, not to think about the 1930s, with the Great Depression, the rise of Fascism, violence against minorities, and much talk of making countries ‘great’ again. The visit was well worth it, not least because it introduced me to a lot of painters with whom I was unfamiliar. Yes, Wood, Edward Hopper, Georgia O’Keefe, Philip Guston and Jackson Pollock are all represented among the 45 pictures in the exhibition, but there is fine work on show by artists who, at least on this side of the Atlantic, are considerably less well known. Moreover, besides displaying some terrific paintings, the show is very attractively arranged, its three rooms dealing with different but related themes. The first looks at depictions of urban and industrial life; the second deals with rural life and depictions of American history (or legend, as John Ford might have put it); and the third presents darker representations of the world, plus a number of more abstract paintings that presage the art that would follow in the 40s and 50s. Consequently, the show is not only rewarding on an aesthetic level but fascinating for its historical and socio-political insights. Paul Cadmus’s ‘The Fleet’s In’ (1934) and Philip Evergood’s ‘Dance Marathon’ (1934) depict, without glamorisation, the kind of activities later given a rather more romantic treatment in the movies On the Town and They Shoot Horses, Don’t They? ; while the ritual of cinema-going is captured not only in the aforementioned Hopper painting but in Reginald Marsh’s ‘Twenty Cent Movie’ (1936), which rhymes the colourful characters hanging out at the entrance of New York’s Lyric Theatre with the advertisements (‘joys of the flesh’!) and movie posters on the walls. (I myself was delighted to note that Rouben Mamoulian’s We Live Again was one of the features billed.) But perhaps my favourite picture in the first room was Stuart Davis’s ‘New York – Paris No. 3’ (1931), a jazzy, decidedly modernist conglomeration of iconic objects, buildings, signage and shapes that seems to fizz with hope for a brighter future. work – and Alexandre Hogue’s bizarre, symbolic ‘Erosion No 2 – Mother Earth Laid Bare’ (1936) which shows a desiccated dustbowl landscape suggestive of a woman’s naked corpse. The gathering in Paul Sample’s ‘Church Supper’ (1933), meanwhile, proves just how joyless and unappealing a certain strand of American Christianity can be. But most fascinating for me were the five pictures in the room by Grant Wood. Hitherto I had seen only portraits by him, so strangely stylised landscapes like ‘Young Corn’ and ‘Fall Plowing’ (both 1931), with their bulbous hills, bulbous trees and patterned haystacks, came as a surprise: sort of faux naif, but imbued with life, ambiguity, even mystery, not to mention a pleasing sense of scale, with farms and windmills stretching off into the far distance. Wood plays a similar game with ‘The Midnight Ride of Paul Revere’ (1931), an intentionally childlike evocation of the patriot’s ride through Massachusetts; with its snaking road, brightly lit toy houses and church, tiny witnesses and geometric topography, the legend is transformed into something enjoyable but implausible. (I was reminded of Harpo’s ride towards the end of Duck Soup, released just two years later.) One is often left bemused, even mystified by Wood’s seemingly ambivalent take on his material. What are we to make of the three ‘Daughters of Revolution’ (1932) posed before the heroic painting of Washington crossing the Delaware. Does that daintily held cup really reflect the indomitable pioneer spirit? And then there is ‘American Gothic’ itself. Is the woman the man’s daughter or wife? (Wood’s sister, who posed for the picture, insisted it was the former, but I’m not so sure.) Is there any love between the two characters? What does the woman’s gaze convey? However very simple and straightforwardly figurative Wood’s paintings appear to be, they always seem to require, even demand that we meet them halfway, as it were, in order for their various levels of meaning to come into focus; we need to engage with them imaginatively. That’s undoubtedly true of the one Wood painting in the final room of the show, ‘Death on Ridge Road’ (1935). It’s another landscape seen from a surprisingly lofty perspective, but this time depicts an accident about to happen: a sleek black limo, having just overtaken a more modest car on a winding country road, is about to collide with a red farm truck – the omens are there in the cross-like telegraph poles and the storm brewing over to the right. It’s a strange, resonant and powerful picture, and one of the most immediately effective in the room. I myself wasn’t so taken by the Dali-esque surrealism of Federico Castellon’s ‘The Dark Figure’ (1938) or of Peter Blume’s anti-Mussolini picture ‘Eternal City’ (1937), though Philip Guston’s ‘Bombardment’ (1937) – atypical, perhaps, but a marvellously robust, dynamic and rightly horrified response to the bombing of Gernika – is one of the most impressive paintings in the exhibition’s look at how artists responded to the ugly political developments of the 30s. 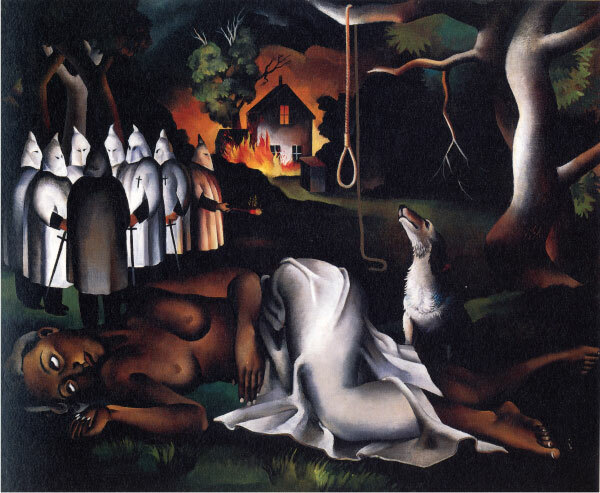 That, and Joe Jones’ ‘American Justice’ (1933), a brutally vivid picture of a semi-naked African American woman raped and lynched by members of the Ku Klux Klan, who stand in a group behind her, having also torched her home. It’s the stuff of nightmare, and no image in the exhibition felt more pertinent to the world we live in. All pictures courtesy of the Royal Academy of Arts, except ‘Young Corn’ and ‘Death on Ridge Road’ (public domain). ‘America After the Fall: Painting in the 1930s’ continues at the Royal Academy of Arts until 4 June 2017.